A variety of patio stone designs are available on the market today. With such a big selection, the most difficult part of designing your new patio is going to be choosing which ones you like the best. 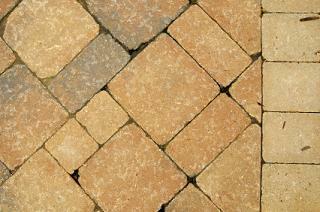 Paving stones - These usually come in two color choices, red brick and gray. They are solid and durable and can be cut to fit any shaped design. Flagstone - These are large flat stones that come in a wide range of colors like chocolate brown, blue and neutral beige. These stones will give your patio design a natural look and feel to it. Tumbled stone - These stones come in different shapes and sizes and have rounded edges. Fieldstone - Fieldstone comes in natural, mostly neutral tones. They have a great texture to them, which adds a bit of design interest. If you want your patio design to blend with the natural landscape, a fieldstone design is perfect. Pacific Paving Stone - Check out their large gallery of backyard patios, walkways and pool decks. Pro Scape Rocks - This website has pictures of patios broken down into total cost. This is a great to use when planning the budget for your new patio. Make a sketch - Always start with a sketch of the design. Include measurements of the length and width of the patio as well as the dimensions of each stone. Don't go by memory, especially if you have people helping you because not everyone is going to see what you see in your head. Decide on size - This depends greatly on the amount of space you have in your backyard and the amount of money you have in your budget. Properly prepare the ground - Remember, the ground has to support all the weight of these stones, you wouldn't want to see your beautiful patio start to shift and fall apart just because you didn't prepare the ground properly. Dry fit the first row of stones - This will give you a feel of what your finished patio is going to look like. Gather all the materials and tools - This will prevent you or anyone else from having to run out to the local home improvement store for missing supplies. For many homeowners, calculating the number of pavers needed seems a bit overwhelming, but a calculator takes away the confusion. Any sized patio is a big undertaking for your average do-it-yourselfer and it is definitely not a one-person project-especially if this is your first time even attempting to build a patio. A beautifully built patio adds value to your property while requiring little upkeep. A beautiful, properly installed patio should last throughout the life of the house.Given the cost and time to build a new patio, if you're in doubt of your skills, call in the professionals. The extra money paid to have builders come out will be well worth it.